Boy, was this old cottage in bad shape when the Morgan family bought it. The tiny farm manager’s house was one of four buildings on auto magnate Henry Ford’s former 1930s Georgia plantation, but it was sinking into the low, marshy area it sat on and was only being used for storage. They stripped the paint off the poplar tongue-and-groove board and sealed the heart pine flooring with a clear polyurethane to bring back the original charm of the old wood in the cottage. It always makes me happy to see people restoring old places like this instead of tearing them down, which, let’s face it, would’ve been a lot easier considering the shape it was in. Visit Coastal Living for more information and to see the rest of the photos by Deborah Whitlaw Llwellyn. Can you believe it’s September already? We’re well into the school year now but still struggling to adjust to the new morning routine in our house. I miss the lazy days of summer already! What a beautiful transformation! So glad they didn’t tear down that sweet little house. It’s just amazing. It does — way too early! We have to be up at 5:30 now for school and I kind of feel like I’m in a groggy daze for the rest of the day. I’m going to have to start taking naps or something until my body adjusts to the new schedule. I would LOVE to get into fall decorating…..however, since it is still in the 90’s in Florida, it seems a little premature…..or just wishful thinking. This little place is beautiful! I love that they have restored the wood in its natural colour. Back to school is a bit rough on the whole family, but we will overcome! The weather is more summer like now than it was during actual summer! I know, what’s that about? We finally get summer weather when it’s over and the kids are back to school. Weird! I LOVE this house, inside & out. So perfectly done! Love this. Especially the porch with that view! This is such an adorable house, and I’m so glad they restored it. I would have painted the beadboard inside, but otherwise it’s great. Love that board and batten siding and tile roof – how cool! I’m with you, there’s a lot of wood going on in there and painting the walls would make it look fresh and bright. I love what they did with the kitchen.. So true, Connie. Not everyone has the time/money/skills to pull something like this off. Wish I did! Oh, I wish I knew, but I didn’t see any source info for that. Anyone else recognize it and have any ideas? I agree about how that run down cottage was saved. Unfortunately, most people cannot afford to take on such a huge project. I love when people lovingly ressurrct out past!!! I’ve always wante to this! Yeah them???? That’s my couch! Or what it looked like seven years ago before cats and kids got to it. Thanks for showing this wonderful house rescue. I’m so glad it was reclaimed. They did a beautiful job. No kidding? Too funny, Wendy. Over here in Germany, I’m in the mood for some fall decoration as well. The weather makes it a lot easier, too. We had an awful summer, it was cold and rainy, and now it still hasn’t changed. My mother-in-law gave me a nice yellow pumpkin, and I think I might start putting the summer stuff back in the boxes today or tomorrow. Lovely cottage, Julia! It amazes me how some people can see the potential when others would have ordered a wrecking ball. Serious kudos! Absolutely outstanding! I usually love painted wood interior and do, but I can’t say I would change what they’ve done, if it were me. It’s absolutely spectacular. As for board and baton exterior, I think I’ve decided I’m in love. Pinterest, here I come! Thanks for sharing this renovation Julia! I had not seen this one and love it. Very glad to see such a classic cottage brought back to life! 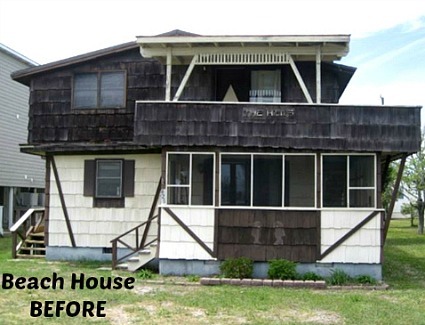 What a beautiful house with amazing makeover. This little place is very captivating. I love the exterior so much .Picket fence is charming which gives an elegant touch to this lovely cottage as well as safety and security. The kitchen is cozy & inviting. Kudos is outstanding .Nice share.